Who doesn’t love a madeleine? The recipe I’ve used since I first bought the New Larousse Gastonomique (1977) is its recipe for plain madeleine. that makes it almost 40 years since I bought the book new when it came out. What I like about the New Larousse Gastonomique recipe is its utter simplicity. It’s a poundcake. You mix equal parts by weight of sugar, flour, melted butter, and eggs and that’s it. The same ingredients are treated a little differently in wonderful 1893 The Art of Pastry Making: According to the English and French Methods by Emile Herisse. I think you’ll find it a worthwhile book to download. His recipes are unusually approachable. 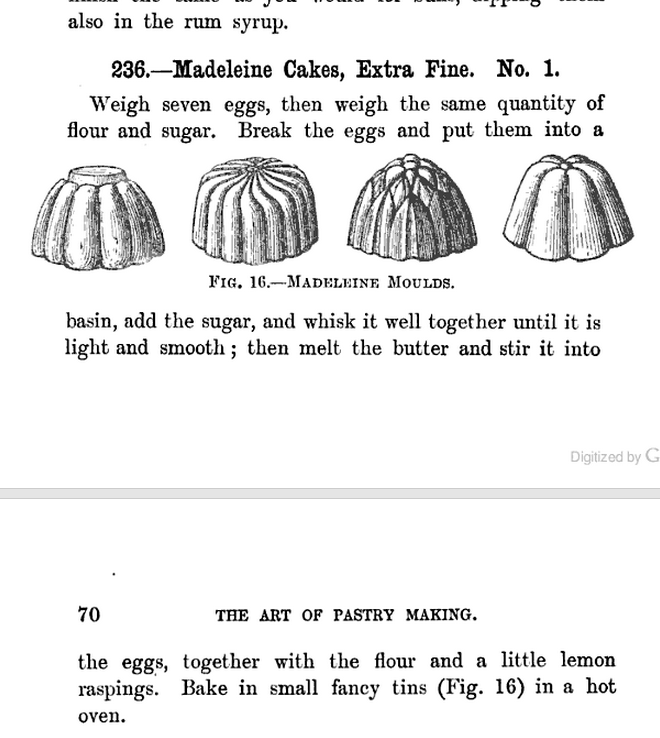 Herisse’s Recipe for Madeleine cakes, extra fine, number 236, is identical to the Larousse recipe except for one detail. Herisse asks that you beat up the eggs and sugar before adding the butter and flour. I like this approach because it reduces the time stirring the flour and thus potentially developing the gluten. Mix the eggs and sugar, but only just. Do not whip into the more standard pale ribbon. Oven pre-heated to 375F or 190C. 1. Melt the butter over low heat being extra alert to be sure it doesn’t simmer. I turn the heat off when the butter is about mostly, but not all melted. 2. As the butter is melting beat the eggs and sugar but only just enough to mix them. Do not beat so they form a ribbon, as so many recipes ask you to do. 3. Pour the butter into the egg and sugar mixture, stir until it is blended in, then stir in the the flour, a little at a time until it is just mixed. This is most easily accomplished mixing with a clean hand but a whisk or wooden spoon can also be used. No need to use an electric beater with the small quantity. 4. Fill well buttered madeleine molds, or a cake mold of your choice, about 3/4 full. 5. Bake in a hot oven (375F or 190C). If baking in madeline molds then 15 to 20 minutes should suffice.